Here’s a riddle for you: What’s the longest running, yet shortest, military tradition in the world? Give up? It’s the Tower of London’s Ceremony of the Keys. Normally, when people visit the Tower of London, they visit during the day. Hordes of tourists from all over the globe cram into the Tower grounds every day to get a glimpse of London’s medieval past. 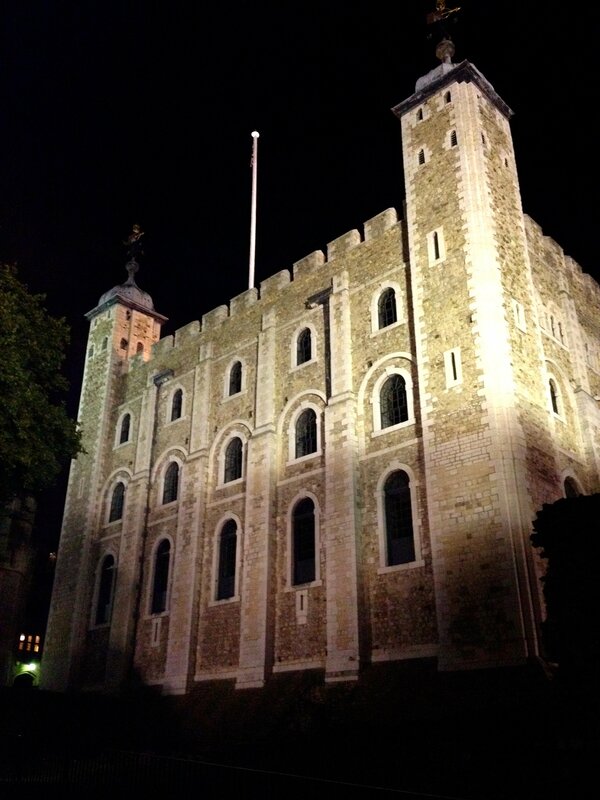 Then, there are a few of us diehards who have done the Tower of London Twilight Tour . It’s brilliant and I highly recommend going to see the Tower when everyone has gone, and only the Yeoman Warders and spooky spirits are out. But that isn’t all there is to the Tower, there is the 700 year old Ceremony of the Keys. It’s the longest running (and shortest) military ceremony in the world. Every night, at 9:53pm on the dot, the Warders begin their 7 minute lock up ceremony, rain, wind, snow or shine. They lock the Tower in the same manner since the 12th century. The first recorded mention of the ceremony is in 1380, but the locking of the Tower can be traced further back to the reign of Henry II (March 5, 1133- June 6, 1189). He disliked having the gates open so he insisted they be locked from sundown to sunrise every night. Now you’re saying hang on, this ceremony is at 10 o’ clock at night, well past sunset. Yes, thanks to the Duke of Wellington (May 1, 1769 – September 14, 1852) who in 1826, had 1,000 antsy soldiers stationed at the Tower and felt it would be best to give them a more lenient curfew to carouse and enjoy all that London has to offer lest he have a mutiny on his hands. He reset the curfew to 10pm and it’s been that way ever since. To its credit, the ceremony has only been late once in its 700 year history; on September 7, 1940, Germany bombed London and the ceremony was delayed by 7 minutes. But the show went on! Amidst bombs, and extreme danger, the Warder heading the ceremony insisted, (in spite of being gravely injured) that they finished what they had started. Sadly, that Warder died as a result of those injuries 3 years later, making him the oldest running Warder in history (1908 – 1943). English tenacity at its best. While the time may have changed, the actual ceremony hasn’t. When I watched the ceremony, it gave me the goosebumps. It was like stepping back in time, but really stepping back. The events unfolding before you have been repeated daily, in the same fashion for over 700 years. Any Warder at the Tower can conduct the ceremony. The soldiers involved in the Tower’s Ceremony of the Keys are young servicemen. The Warders, as always, are fountains knowledge as well as stellar ambassadors to the Tower. They are absolute gems; they are witty, funny, and extremely professional. They take this ceremony and their duties at the Tower very seriously; they are not mere tour guides. All Warders come from the military, having seen 22 years of service before being able to join the esteemed ranks of the Yeoman Warders. The best part of this: it’s FREE! (There is a £1 booking fee to cover admin costs but the ticket is free). A visit to the Tower during the day costs about £22 so it’s nice to get in and see a piece of history without paying an arm and a leg. This is also why it’s booked up so far in advance. 1.) Don’t be late. This event is very popular, and at the time of this writing, it is booked solid until August 2015. Your name is on a list, and if you miss it, you can’t come in and you will have to wait months for another shot. Come early with your ID and ticket ready. 2.) No cameras, no recording devices, no mobile phones. All of it off. You’re permitted to take pictures after the event of the Tower, and Tower Bridge is lovely at night from the Tower, but during the ceremony, absolutely no photos or videos are permitted. It’s an incredible tradition and over in 7 minutes so it’s best if you listen and immerse yourself in the moment rather than texting your mates or the fiddling with your camera. 3.) Dress warmly. I did this in early March. I’m Canadian, I can take standing outside in near zero temps for a while and not bat an eyelash, however, some of you may not be so inclined. You have to get to the Tower well before the event, stand in a queue and wait outside. So unless you’re doing this in the summer, I suggest your bring a jacket to keep warm. You’re not walking far or moving about very much once you’re inside the walls, and the entire ceremony takes place outside so dress accordingly. Also, this is England – bring an umbrella just in case. Enjoy the marvellous piece of England’s medieval past!